What if I say methi (fenugreek) seeds make a great subzi and it is not bitter at all? Very few believe this and I know a few who make this subzi after removing the soaking water, boiling it in pressure cooker and removing even the cooking water to 'remove' the bitterness. Trust me you are not supposed to discard the soaking water at all and the methi seeds do not taste bitter in this subzi. Sharing a methi papad ki subzi today, a unique flavour that brings a just a light hint of methi bitterness and the alkaline taste of raw urad dal papad that gets balanced with yogurt. Methi papad ki subzi was not made in my parents home ever. I know my mother would have scoffed at the idea of methi seeds in a subzi though she would love papad in any form. We occasionally used to make papad ki subzi with the sour buttermilk sometimes just to finish the weekly stock of buttermilk that was leftover after the ghee making excercise back home, normally used for making kadhi or dahi wale alu. But that was the end of anything to do with papad in a curry, methi was used in the tadka though, just 1/2 tsp of it. The hint of bitterness methi seeds bring into a dish when used in the tadka is quite a subtle flavour that enlivens many a curries in the eastern part of India I must add. Using methi seeds in bulk to make the curry was not something my family would have taken to. One of my Marwadi friend during school used to talk about this subzi but I am sure in that age we are not too sure to serve such unusual food to guests, so I never got to taste methi ki subzi while I loved the kanji vadas and the kair sangri pickles and many types of sweets that her mom made. I was actually surprised to taste methi papad ki subzi in a roadside dhaba in Rajasthan couple of years ago and it was not bitter at all. I was so intrigued that I asked the dhaba owner and he shared a useful tip to make this subzi. He told me not to touch the methi once it is soaked, just tip them directly into the cooking pan when cooking the subzi. He mentioned if the methi seeds are punctured after soaking they turn bitter, else they remain good. I tried the subzi as soon as I was back home and this subzi has been a regular since then. Even the husband likes it, probably more because he tasted it in a roadside dhaba for the first time but that is good for me. Soak the methi seeds overnight in a cup of water. Do not disturb once soaked. Remember you are not supposed to touch the soaked methi seeds and puncture its mucilage layer. Whisk the coriander and cumin powders in the yogurt, add water and whisk again to make it smooth. Keep aside. Heat the oil in a deep pan, add the asafoetida and let it get aromatic. Not take the pan off the heat and add turmeric powder and chili powder, mix well and let them get aromatic. Pour the yogurt spice mix slowly into the pan and whisk, take the pan back to the stove and whisk to keep it cooking evenly. As soon as the curry starts simmering, pour the soaked methi seeds along with the soaking water and simmer for 10 minutes. Add the broken papads, simmer for a couple of minutes and take the pan off the stove. Sprinkle coriander leaves and serve hot with chapatis or parathas. The best combination with methi papad ki subzi is ghee soaked bajra roti if you like, this methi papad ki subzi makes a great side dish for a big Indian spread as well. 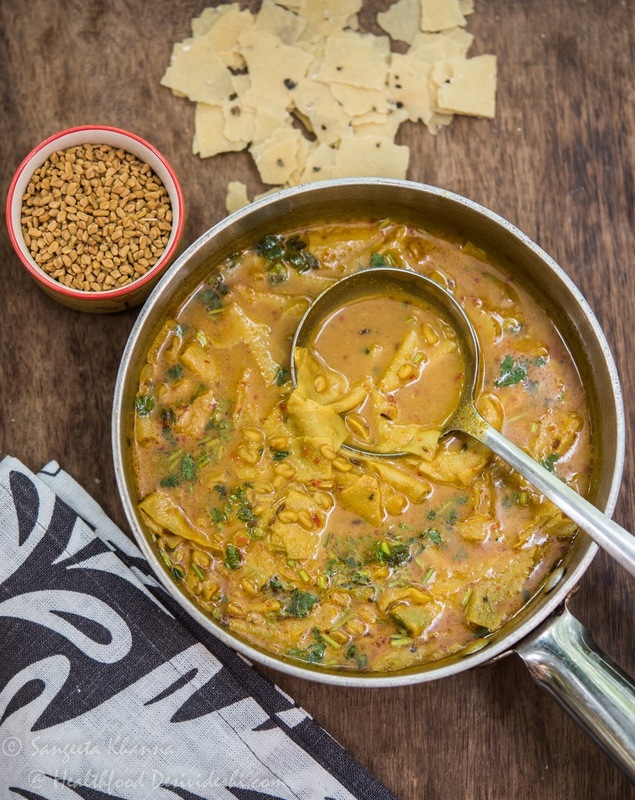 Make this methi papad ki subzi next time when you are entertaining guests. Add some raisins and may be some fed cashews to make the subzi a bit rich. Raisins actually give methi papad ki subzi a nice dimention. It is great for diabetics, is a very good alkalising food but most of all it tastes great. The traditional recipes that have survived the test or time are here to stay. The only grudge is that we don't know them all. It is good till I keep getting acquainted with them one after the other. A slow learning curve is better that never getting exposed to such great food. Hi..about methi..I would like to tell about another dish I had with Methi....that was methi wale chawal..which my colleague's mom in law lovingly makes. That also involved soaking of methi seeds n discarding water..thats the only thing I remember when she described recipe while I was busy in devouring the heavenly dish. This has really intrigued me about versatility of the humble seeds and the cooking credentials of the folks who created such dishes. I love papad ki sabzi and make it often. Thanks for the methi dana tip. I have been a silent reader of your blog for a few years now. I just wanted to take the time to appreciate all the thought and work you put into your blog. I have lived in the midwest part of USA for over 2 decades now. We only get limited produce and do not have many Indians around. I know that when I am looking for inspiration to try out something new, all I have to do is browse through your blog and tada; the family gets to eat a new version of something or a new dish altogether. Keep making your music. There are listeners out there! Take care. Thank you so much for letting me know. I crave to hear such great feedback about Banaras ka Khana.